Deirdre M. Daly, United States Attorney for the District of Connecticut, announced that PEDRO RIVERA, also known as “Cheito,” 36, of Groton, pleaded guilty today in Hartford federal court to one count of conspiracy to possess with intent to distribute 500 grams or more cocaine. According to court documents and statements made in court, in early 2012, Homeland Security Investigations (“HSI”), the U.S. Secret Service and the New London Police Department initiated an investigation to combat the large-scale trafficking of heroin and cocaine from the Dominican Republic and Puerto Rico into and around southeastern Connecticut. The investigation revealed that certain members of the conspiracy coordinated the shipment of heroin, and sometimes cocaine, via human couriers from the Dominican Republic to the United States. Other members of the conspiracy obtained kilogram-quantities of cocaine in Puerto Rico and then mailed the drug to locations in and around New London where it was sold to distributors and customers. Narcotics were also obtained from sources in New York City and Rhode Island. More than 100 individuals were charged with federal and state offenses as a result of this investigation. According to statements made in court, RIVERA arranged the shipment of cocaine from sources in Puerto Rico to the New London area. RIVERA’s cocaine trafficking operation was assisted by individuals who lived in and around Morovis, Puerto Rico, including his parents, Juan Rivera Ortiz and Ivette Pagan Rodriguez. RIVERA then distributed the cocaine to customers in southeastern Connecticut through a network of associates. RIVERA is scheduled to be sentenced by U.S. District Judge Vanessa L. Bryant on March 3, 2015, at which time he faces a minimum term of imprisonment of five years and a maximum term of imprisonment of 40 years. RIVERA has been in custody since his arrest on April 3, 2013. Rivera Ortiz and Pagan Rodriguez pleaded guilty on November 24, 2014, and await sentencing. This matter is being investigated by Homeland Security Investigations; U.S. Secret Service; U.S. Postal Inspection Service; Bureau of Alcohol, Tobacco, Firearms and Explosives; U.S. Customs and Border Protection, Office of Air and Marine; Connecticut State Police; New London Police Department, Norwich Police Department, Waterford Police Department, Groton Town Police Department, East Lyme Police Department and Putnam Police Department. 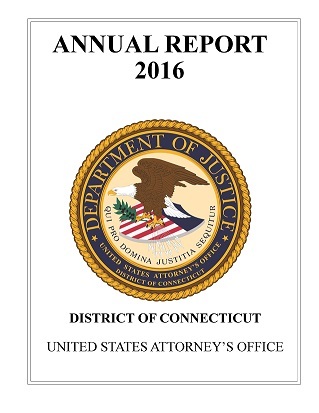 The United States Marshals Service; ICE Enforcement and Removal Operations; Drug Enforcement Administration; HSI Assistant Attaché, Santo Domingo, Dominican Republic; HSI Arecibo, Puerto Rico Resident Office; Internal Revenue Service – Criminal Investigation; Connecticut Department of Correction, Parole and Community Services; and the Groton City, Willimantic, New Haven and Bristol Police Departments have provided valuable assistance to the investigation. The federal case is being prosecuted by Assistant U.S. Attorneys Sarah P. Karwan, Alina P. Reynolds and Henry K. Kopel. The state cases are being prosecuted by the State’s Attorney for the New London Judicial District and Senior Assistant State’s Attorneys Paul Narducci and Stephen Carney.